Sahar ki Masjid. The mountain seen on the left is Pavagadh. 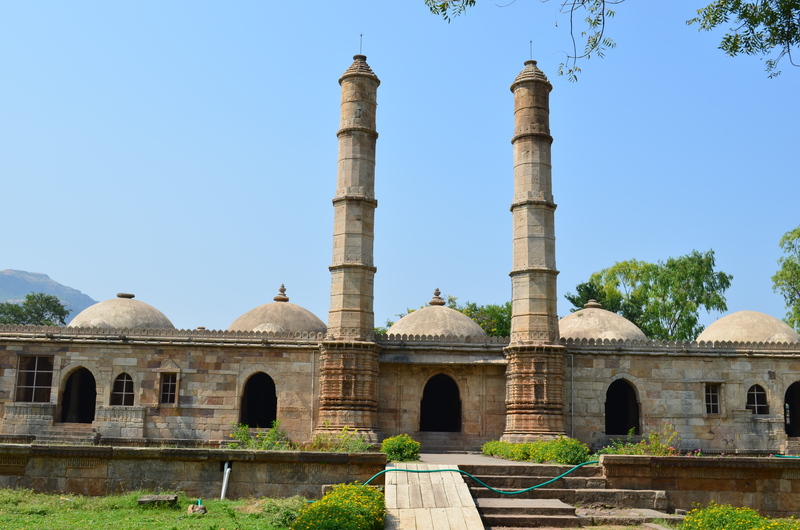 The ancient town of Champaner is just 150 kms from my hometown of Ahmedabad. It has the most well-preserved Islamic monuments from the pre-Mughal era in India. But we never thought of visiting it. 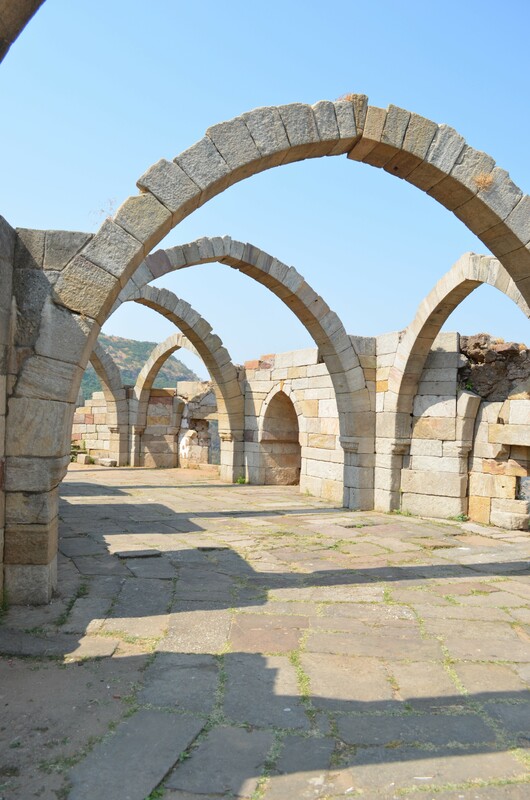 In October 2011, while going to Vadodara, we decided to go and see both Champaner and Pavagadh. 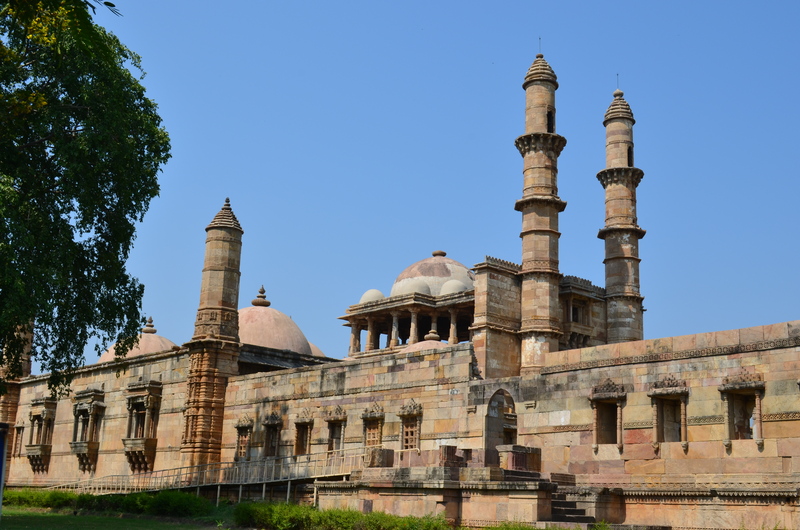 In 1535, the emperor Humayun captured Champaner. This kingdom then passed under the Mughal empire and the capital went back to Ahmedabad. The original town is now deserted. For that matter, we saw very few visitors like us. Most of the people we encountered were Hindu or Muslim pilgrims visiting the Pavagadh mountain. The places we saw were Jama Masjid, Sahar ki Masjid and Saat Kamaan. The architectural style of the monuments comprises of both the Hindu and the Islamic way. From Sahar ki Masjid, the view of the Pavagadh mountain is enchanting. No buildings in sight even today, this view probably would have been the same 500 years back too. Saat Kamaan is on the way to the top of the very steep Pavagadh mountain. We missed it twice before finally finding it. The landscape consisting of the mosques and forts in between the green jungles of Champaner is breath-taking from this high point. It felt good to see that somehow these monuments had survived the test of time, giving a glimpse into what life must have been so many centuries ago. Saat Kamaan, on way to the top of Pavagadh mountain. Previous Post Mobile phone zero to hero! Hello Bindu masi, I remember your trip. Your visit actually prompted us to go see that place.